The last game of round two in the NFL playoffs will feature the defending Super Bowl champion Philadelphia Eagles taking on the team with the best record in the NFL, the New Orleans Saints. Philadelphia advances after backup Nick Foles led his team to a 16-15 victory over the Chicago Bears. The Saints had a first-round bye. These two teams have already played once this season, where New Orleans absolutely crushed Philadelphia on November 18, 48-7. With just five seconds left in the game and a 43 yard field goal all that stood in the way of the Chicago Bears advancing, it looked like the Philadelphia Eagles season was about to end. However, Treyvon Hester got just enough of his hand on the ball to slightly redirect it, as it bounced off the upright and back onto the field giving Philadelphia the one point victory. Quarterback Nick Foles continues to build on his legend, winning his fourth straight playoff game for the Eagles dating back to last year’s Super Bowl championship run. The Eagles quarterback threw for 266 yards and two touchdowns, rebounding after throwing two early interceptions in the game. His performance proved to be huge, as the Eagles gained just 42 yards rushing. 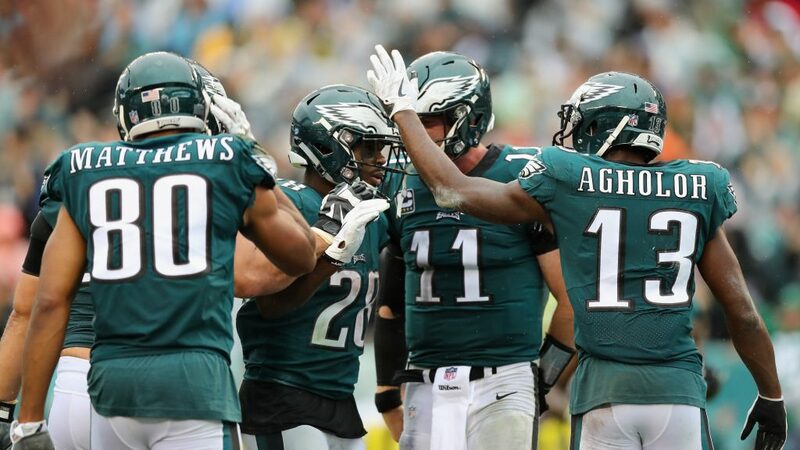 The Eagles were at risk of not making the playoffs at all, but Foles took over after Carson Wentz went on injured reserve, leading the team to victories in the final three games of the season. The Philadelphia quarterback threw for 1413 yards and seven touchdowns, completing an impressive 72.3% of his passes. He will have to continue to impress, as the running game is averaging less than 95 yards per game. Philadelphia averaged 22.5 points per contest while allowing 21.4 per game. The offense average 361.4 yards per game while the defense gave up 366 yards per contest. While the offense average less than 95 yards rushing per game, the defense was dominant against opponents as well, allowing 95.1 rushing yards per game. The New Orleans Saints won 13 games in 2018, the third time they have reached that mark in franchise history and the first since 2011. What has made this team such a powerhouse has not just been their explosive offense, but has been an equally impressive defense. New Orleans recorded 49 sacks this season, led by Cameron Jordan who led 12.0. Demario Davis led the team in tackles with 110 and added five sacks and two fumbles. In all, New Orleans recorded 31 turnovers (19 fumbles, 12 interceptions). The Saints open the season with an eight point loss to Tampa Bay, then rattled off 10 straight victories. However, they would lose three of their final five games, including to Dallas, Tampa Bay, and Carolina on the final weekend of the season. New Orleans had a number of impressive victories this season, including crushing Philadelphia, defeating the Rams, Minnesota, and Baltimore. Drew Brees had another impressive season, completing 74.4% of his passes for 3992 yards and 32 touchdowns. Brees threw just five interceptions this season and was sacked only 17 times. Michael Thomas was his number one target, making 125 catches for 1405 yards and nine touchdowns. Alvin Kamara had an impressive season as well, leading the team with 883 yards rushing and 14 touchdowns, while making 81 catches for 709 yards and four scores. New Orleans is averaging 31.5 points per game while allowing 22.1 points per contest. They are averaging 379.2 yards of offense per game while allowing 349.1 yards per contest. 4-0 ATS in their last four playoff games. 5-0 ATS in their last five games in January. 4-1 ATS in their last five games against teams with a winning record. 5-1 ATS in their last six games in January. 25-6 in their last 31 games at home when facing a team with a winning record on the road. 1-4 ATS in their last five games. There are two things that cannot be denied heading into this game. First off, Foles has proven himself to be a big time performer, winning seven straight games that were win or go home contests. The second is that New Orleans put a beating on Philadelphia, showing that they are clearly the better team. New Orleans is favored by seven in Philadelphia is 1-4 ATS in the last five meetings between these two teams. As much as we like what the Philadelphia quarterback has done, the Eagles are simply not good enough to beat the Saints.